New Year resolutions are a tradition. You start the new year with every intention of going to the gym three times a week and eating broccoli with every meal. But you’re human and life happens. This year, avoid the unrealistic goals altogether and create a few new habits instead. Habits are easy! 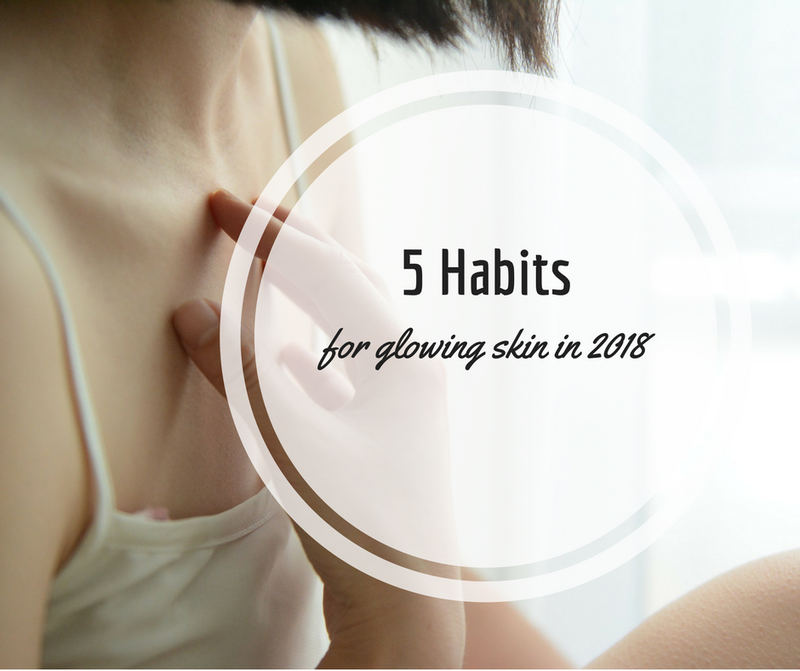 Here are my top five habits you can incorporate into your life for awesome skin in 2018. Drinking water is probably the easiest and healthiest new habit you can add to your life. Get yourself a shiny new water bottle and keep it handy so you can keep yourself hydrated. Your whole body will thank you. Get up and move around throughout your day. No, I’m not making you go to the gym. I’d never do that to you! It can be a simple as a walk around the block. As I write this, it’s snowing so hard there’s no way I’m going outside for a walk. Not gonna happen! But every so often, I get up from my desk and dance around like a maniac to the music. You may not want to do that at the office, but you can walk around the halls or do some great stretches at your desk. Or play a rousing game of “head, shoulders, knees & toes” with your littles. Washing your face before bed is a must! I’m not kidding! If you’re going to bed with your makeup on, you’re making your skin angry at you. And messing up your lovely linen pillowcases. Take off that makeup and the dirt and stress from your day with a quick soap & water wash. It’s a really relaxing and quick nighttime routine that will pay off for your complexion. Don’t forget to brush your teeth, too. Sorry. I’ve become my mom. Moisturize and use sunscreen every day. Every. Single. Day. Apply a moisturizing sunscreen (or two separate products if you need to) in the morning before applying makeup. As a benefit, it acts as a primer for your foundation, smoothing your skin. After washing your face before bed (ahem), reapply moisturizer. Exfoliate at least twice a week, but don’t get carried away. Too much exfoliating will damage your skin’s ability to regenerate. Use a sugar or salt scrub and apply using your two middle fingers, then massage gently in circular motions. Too much pressure can cause your skin to tear. If these five tips aren’t in your current arsenal of habits, add them right away and start seeing the results of healthy, happy skin for 2018 and beyond. Bonus: Here’s my recipe for a simple DIY sugar scrub you can whip together in no time at all! · Coconut oil, or avocado oil, or hemp oil. Do not use cooking oils such as canola or safflower. · Airtight jar for storing your scrub. · Optional: 1-2 drops essential oil of your choice. In small bowl, combine your oil(s) with the sugar to make the sugar damp but not wet. Like wet sand, but not mud. Blend well. Add essential oil if you like. Store in an airtight container to preserve freshness. To use: Start with a clean, freshly washed face and apply a tablespoon worth of the scrub to your fingers. Using your two middle fingers, apply to your face and work the scrub in small circular motions until you’ve done your whole face. Rinse off with warm water, pat dry.